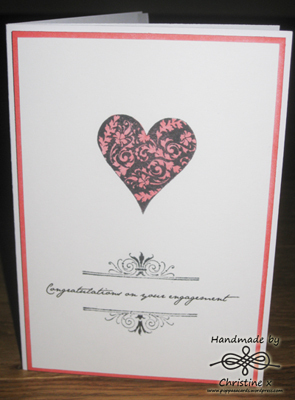 This is the first engagement card that I have made – I have always shop bought them before. I tried to keep it nice and simple so that I wouldn’t mess up and I am quite pleased with the results. I printed the text onto plain white cardstock then used an Artemio stamp set (Ref 10020004). The image is printed with Memento Tuxedo black ink and the colour behind the heart is done with Distress Ink in tattered rose.